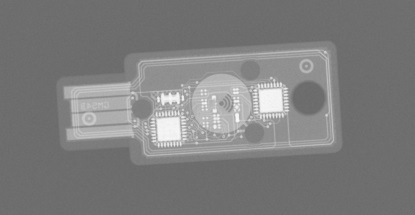 Not really sure if this really applies here but since I have access to an x ray machine I thought I would take a picture of the guts of a Yubikey. Hey, that's cool! 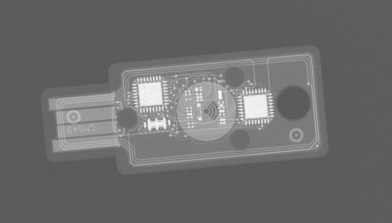 Anyone got an x-ray of a Yubikey Neo? Cool! Glad you bumped it, I hadn't seen it. Thanks for the images, very interesting! I can provide them in Dicom format (you can download a suitable free Dicom viewer). They are about 15mb in size, how would it be best to send them to you? I am a service engineer for healthcare x-ray equipment. The file size was only 2.5mb in the end. If you want a higher resolution image, then let me know and i will use one of our newer specification detectors that has a resolution of 125 micron instead of 160 micron. Thanks for posting, unfortunately the wikisend link expired too quickly! Cool, looking forward for the new images nano/edge!